Heidelberg , (Lat. Edelberga; anc. Myrti-letum), a city of Baden, on the left bank of the Neckar, 10 m. S. E. of Mannheim, and 31 m. N. N. E. of Carlsruhe; pop. in 1871, 19,988. It is chiefly celebrated for its university, founded by the elector Rupert toward the end of the 14th century, and reformed by the grand duke Charles Rupert in 1803 under the title of Ruperto-Carolina. The university library, containing 200,000 volumes and 2,000 manuscripts, is exceedingly rich in antique works and early editions. After the capture of Heidelberg by Tilly in 1622, the library, which at that time numbered besides the printed books 3,500 manuscripts (exclusive of the French), was presented by the duke of Bavaria to Pope Gregory XV., and by the latter made, under the name of Bibliotheca Palatina, a special section of the Vatican library. In 1797 Napoleon gave 38 of the best manuscripts, obtained at the peace of Tolentino, to the Paris library; but in 1815 these, as well as all the Old German manuscripts of the Palatina, were restored to Heidelberg. The university is very complete in details, embracing a museum of natural history and antiquities, a physiological cabinet, a chemical laboratory, a lying-in asylum, two botanical gardens, a college of agriculture and forestry, an observatory, and a philological, theological, pedagogical, homiletical, and Biblical seminary. It was attended in 1873 by 707 students, under 108 professors. A chair of English literature, the first of the kind in Germany, was established in 1873. There are also an excellent gymnasium and two female schools of high reputation. 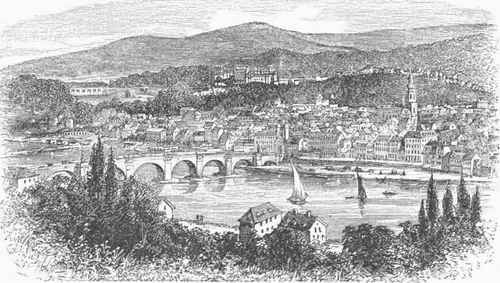 The situation of Heidelherg, in a picturesque and fertile country, not far from the junction of the Neckar with the Rhine, having on one side the Konigstuhl and on the opposite the Heiligenberg, the hills covered with vineyards, and its curious bridge, renders it attractive to the tourist. To travellers its greatest attraction is the ruined castle, which presents in its different portions every phase of architecture from the 14th to the 17th century. Having been restored in 1718 - '20, it was set on fire by lightning in 1764, and it has never been rebuilt or tenanted since. In its vaults is the celebrated Heidelberger Fats (tun), once the largest in the world. The principal manufacture of Heidelberg is beer; its trade is confined chiefly to linseed oil and tobacco. - Heidelberg was attached in 1302 to the Palatinate. Rupert I. enlarged it and made it an electoral residence. In 1384 the emperor Wenceslas signed here the union of Heidelberg, by which the different leagues of German cities were united in one. Heidelberg was plundered and partly ruined by Tilly in 1622, by Turenne in 1674, by Melac in 1688, and by Marshal de Lorges in 1693. These misfortunes led to its decline in political importance, which was finally completed by the residence of the electors being removed to Mannheim in 1719. It was united to Baden in 1802.